Israel continuing to search for 6 Israelis missing after Las Vegas massacre, including 2 confirmed to be near the shooting. 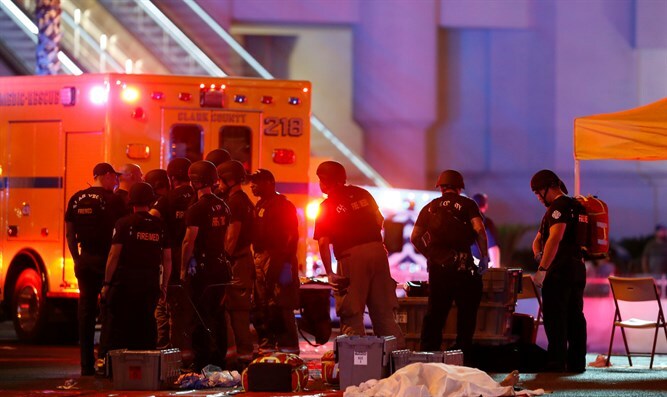 Israel's Consul in Las Vegas, Avner Saban, said Monday that two Israelis who have not yet established contact were in the area of the mass shooting which took place in Las Vegas Sunday night. At least 58 people were killed and 516 people wounded when a gunman opened fire at a country music concert at the Mandalay Bay resort just before 10:30 p.m. local time. The attack was the deadliest mass shooting in US history. Saban told Channel 2 that it is still unclear what happened to the two Israelis, and that six Israeli citizens are still unaccounted for following the massacre. The FBI has asked any witnesses to the shooting to send them any pictures or videos of the incident they may have, as well as any information on the shooter, to aid in their investigation. The ISIS terrorist organization claimed that the shooter, 64-year-old Stephen Paddock, was a convert to Islam and one of their fighters. However, the FBI has debunked the terror group's claims.